The 2017 United Nations-Global Geospatial Information Management Academic Network (UN-GGIM) Forum with the theme “Secure Land Rights and Smart Cities – Making it Work for Sustainable Development” was successfully held on 31 July 2017 at UN Headquarter in New York as part of the Seventh Session of the United Nations Committee of Experts on GGIM. The Forum brought together over 100 delegates and geospatial experts and academics from over 50 Member States, academic institutions, and the private sector. The outcomes of presentations and panels further emphasized the need and significance of developing a roadmap to effectively secure land rights, achieve the sustainable development goals (SDGs) and build smart cities for all, in which geospatial information will play a critical role. The Forum has established a dialogue and a platform for exchanging ideas regarding land rights and exploring its relationship to smart cities while addressing challenges and opportunities. You can access the full report of the Forum discussions and outcomes here and find more information about the Seventh Session here. The UN-GGIM aims to facilitate the development of global geospatial information and to promote its use to address key global challenges. As the strategic knowledge, research, and training arm of the UN-GGIM, the Academic Network, in close collaboration with and support of UN-Expert Group on Land Administration and Management, UN-GGIM Private Sector Network, and UN-GGIM Geospatial Societies is proud to organize the UN-GGIM Academic Network Forum on 31 July 2017 as part of the Seventh Session of the United Nations Committee of Experts on Global Geospatial Information Management. The Forum will discuss issues pertinent to the development, implementation, and use of land administration systems in the global context of the Sustainable Development Goals (SDGs) and smart cities for all. The presentations and panel planned for this forum will highlight how the Academic Network and other UN-GGIM entities are contributing to the development of a roadmap of solutions that overcome land tenure challenges, facilitate the development of technologies and standards, and spatial data acquisition necessary to monitor and measure land indicators for the SDGs and development of smart cities. The Academic Network contributes to strengthening global geospatial information management and is committed to the achievement of the 17 SDGs. The development of future smart cities will require access to inclusive services, technologies, and infrastructures. The “leaving no one behind” principle of the SDGs intends to ensure that efforts towards a sustainable and smart future will develop a better future for all communities. Goals 1, 2, and 5 of the SDGs have designated targets and indicators linked to land tenure rights which signifies the fundamental role of land administration in building sustainable and smart cities for all. The UN-GGIM 2017-2021 Strategic Framework acknowledges the necessity of integrating geospatial information in the process of achieving the SDGs and developing future cities. Strengthening local, national, and global cooperation to foster the integration of legal and organizational frameworks including the SDGs, UN-GGIM 2017-2021 Strategic Framework, Sendai Framework, and Habitat III Urban Agenda will notably impact disaster management, development of adequate policies and regulations, climate action, efficient urban planning, and good institutional governance. As United Nations Member States work towards a sustainable future, land tenure security is one of the greatest challenges identified in the UN-GGIM 2017-2021 Strategic Framework that requires the comprehensive management of geospatial information and resources to ensure social inclusion, economic growth, and environmental protection. The availability of effective and efficient land administration remains a problem worldwide, especially in developing countries where mature land information systems (LIS) and formal land registration systems are not available. Therefore, spatial inclusion, secure land rights, and sustainable land use are all major challenges resulting from rapid urbanization that public and private sectors need to address in the development of future smart cities. 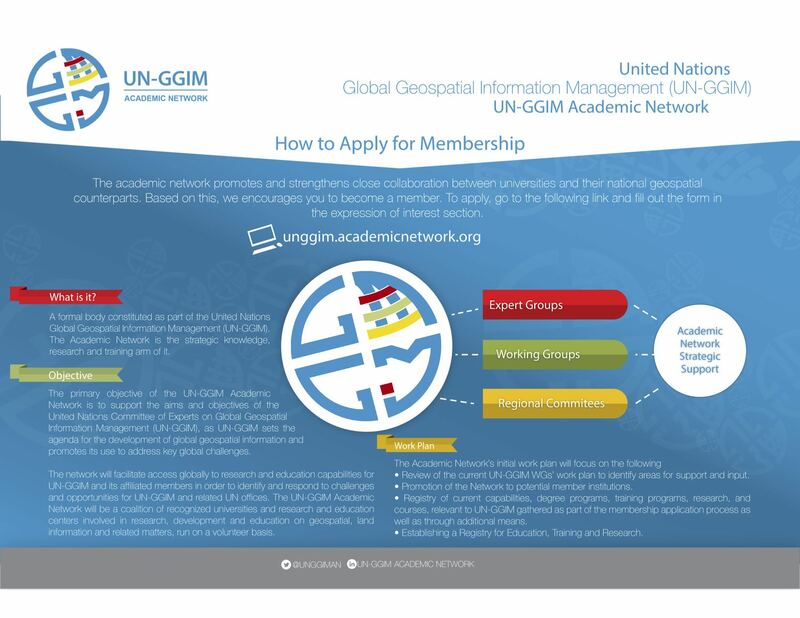 The UN-GGIM Academic Network recognizes the importance of promoting and sharing geospatial data and integration approaches, developing of legal and policy instruments, implementation of institutional management models, providing technical solution and standards, enhancing interoperability of systems and geospatial data, and improving access to quality and timely data. As a result, the Academic Network aims to work in the direction of resolution 2016/27 of the Economic and Social Council (ECOSOC) by promoting the sharing of geospatial data, enhancing capacity building, and inter-institutional cooperation for sustainable development, disaster risk reduction, and policymaking. (e) Develop a future workplan and research agenda to assist UN-GGIM and member states to respond to the SDGs. You may download the Concept Note here.